I was making my man watch Clueless (As is he hadn't!) and I thought 'You know what I had a dress like that...' and it went on like that. Then I started thinking 'That's actually a nice outfit' - I think headed online for some window shopping and it became clear... I've simply fallen in LOVE with the 90's trend! Well I've picked a few varying pieces from the new trends at Topshop - I thought it would be a nice carry on to my WISHLIST'S of the year, by flashing back to the past! Yes, I know, there is other shops releasing their SS13 trends. But I am admiring Topshop's 'go' at the 90's theme they've adapted throughout - Though, I MUST say: There is some pieces that were best left in the 90's... Though the ones I've spotted I've simply fallen in love with - and yes there is a few stereotypes of 90's chic. But they are fab! So that's just a few of 90's style picks - and some are from the new S|S13 sneak peaks! All these pieces from Topshop, give a nice spin or take to the original 90's look - making it more modern and stylish for 2013 - as opposed to some of the more Madonna-esk cringe fashion moments of the 1990's! Symbol Mesh Crop Top - £26 - This stood out so Cher-esk from Clueless. Let's just hope I don't look as clueless in it! Hanna Flatform Sandals - £32 - I'm a HUGE fan of the flatform. They're comfy, practical and stylish - I'm glad they made a comeback! 90's Round Sunglasses - £16 - Move over Drew Barrymore - I've tried these babies on and I think they'll be a keeper this summer! Petite Fleck Midi Dress - £29 - I remember my Mam rocking a midi back then with a pair of chunky boots and thinking she was gorge - so I'm hoping I'll look just as good! 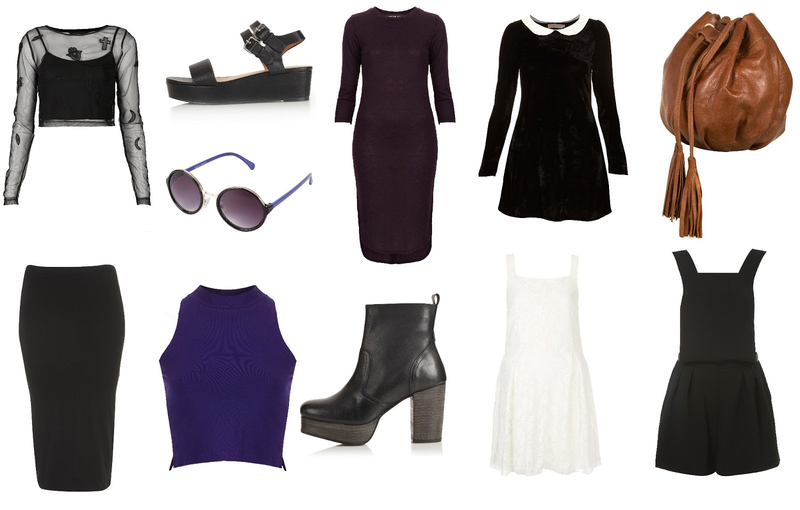 Velvet Peter Pan Dress By Oh My Love - £39 - A velvet dress is like THE staple of a 90's wardrobe. I think I had 6 back in the day - why not get one now eh? Leather Pouch Crossbody Bag - £28 - I remember having a Barbie one as a kid - but I though it needed an update with a fab leather versatile look! Double Layer Tube Skirt - £20 - This goes perfect with a tucked in sheer shirt or a fabulous crop top! Eeek it's simply a must! Skinny Polo Crop Vest - £10 - The crop top is yet another staple of the 90's wardrobe! Topshop currently has a wide range of colour and styles - so this is just 1 example! Aliyah 90's Chunky Ankle Boots - £75 - A bit pricey, but I these fab boots scream 90's and I'm in love with how comfortable these type boots are. Lace Pinny Tunic - £30 - From the new S|S13 White is Right trend - showing us that even us pale ladies can whip out in a white dress. This ones is particularly lovely with it's style - How Baby Spice is it?! Crepe Pinafore Playsuit - £42 - From the Buckles and Bibs range this shows that dungarees don't have to be consigned to denim anymore and they can be versatile for work or night out - any hint why I love it? So that's my choices - there was a few more such as the Flippy Hem Skirts and velvet shorts - but I actually acquired them and I'm just waiting to get rid of this cold before I video blog on them! Eeek it'll be No.3! My choices on the 90's trend aren't to the extreme, but we can't just pick things in a trend I had to make sure they'd suit my shape - always remember that when wanting to hop on the bandwagon! I actually think that I may do a 'Knowing Your Shape' on a few trends - that'll hopefully help a few people along! There is so many different trends on the way this season and I can happily say I'm very excited to see them all! Though, I may not like them all - I'll give it a go once! Now I just need to save my pennies to get these fab items - trials of the love of it! Well I mustn't be alone in this relapse love of the 90's - What do you guys think of this trend? And what are you looking forward to in the new S|S13 trends? I LOVE LOVE LOVE the velvet peterpan dress! so perfect for right now!! It's gorgeous isn't it! I've tried it on and it's rather flattering as well! LOVE that cross crop top! I adore Peter Pan collars, they're so cute! I have a thing for collar detailing, lace collars, studded collars, Peter Pan collars. I love them all! I've never tried velvet though, it might grow on me. I still love the dress, nonetheless! Love the boots! I'm desperate for some just like that, just need the funds!